What’s Behind the Nixed Singapore-New Zealand Fighter Jet Base Deal? The development has highlighted some of the ongoing challenges both sides face in advancing their defense ties in this respect. 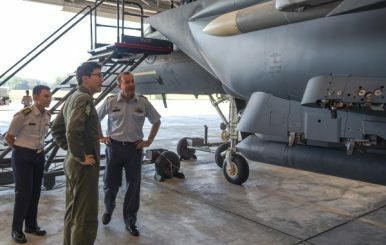 Earlier this week, Singapore’s defense ministry confirmed that a proposal the city-state had been working on with New Zealand for it to accommodate fighter jets would not proceed. While the statement is just the latest in a series of indications that the deal is off, it has nonetheless spotlighted some of the challenges both sides have faced in this regard as they seek additional ways to boost their defense relationship. As I have noted before in these pages, Singapore and New Zealand have a defense relationship that dates back decades, with both joining the Five Power Defense Arrangement back in 1971 along with the United Kingdom, Australia, and Malaysia. Over the past few years, both sides have been discussing ways to further strengthen defense collaboration in various areas, including dialogue, education, and training. One of the proposals both sides had been considering to boost their defense collaboration was the possibility of a pilot training facility at Ohakea Air Base, New Zealand’s third largest airfield, to support training for F-15 fighter jets and other personnel. The idea first surfaced publicly back in 2017, and was among a range of proposals that land-scarce Singapore is considering with its partners to provide room for it to train its military abroad. Both sides had indicated that evaluations of the proposal were ongoing into 2018. As I noted during this process, in spite of the strategic logic of the proposal, this was no guarantee of operational realization. A final deal would require managing challenges such as adjustments made to existing facilities to accommodate new hosting and training, addressing potential concerns of the local community, and keeping costs manageable for both sides. Last month witnessed the first clear public sign that the deal was off, with New Zealand media outlets quoting Defense Minister Ron Mark as saying that the two countries had agreed not to go ahead with the deal. Mark’s comments to online website Newsroom focused on costs – a shorthand for a number of different concerns that in fact existed for both sides. This week, Singapore’s defense ministry (MINDEF) confirmed that the proposal for a long-term training exercise would not proceed. The two countries had “mutually concluded that the proposal will not proceed,” MINDEF said in a statement on January 7 in response to inquiries, according to local media outlets. The fact that this particular proposal did not go ahead is not entirely surprising and hardly unique. Singapore, as other countries, has faced other setbacks in its quest for additional forms of defense cooperation with partner states, with a case in point being a training deal floated with Australia in the past as well. And in this case, as was noted before, it was clear that the realization of this proposal would be partly contingent on both sides getting past some of the challenges that remained. Even though this particular project may not have gone ahead, it will be interesting to see if both sides are able to structure a different kind of arrangement that might achieve their mutual objectives partly or wholly, or pursue other alternatives that may do the same. After all, in spite of the challenges that remain in forging aspects of further collaboration, the opportunities therein nonetheless remain clear. The drills highlighted an aspect of their military relationship amid ongoing challenges.